Here are three short screencasts that give an overview of some of the new features introduced in OpenNebula 4.2 from the user’s perspective. Enjoy! The Cloud view is one of the configurable Sunstone views. This simplified view is intended for cloud consumers that just require a portal where they can provision new virtual machines easily. They just have to select one of the available templates and the operating system that will run in this virtual machine. 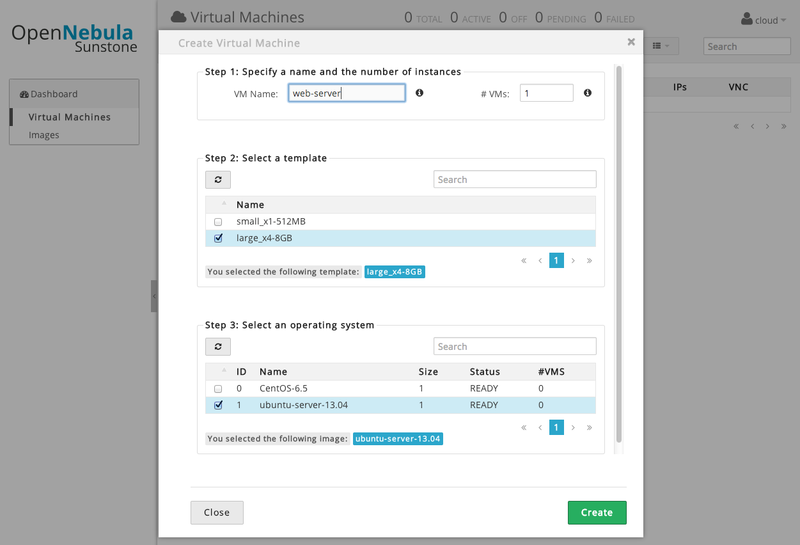 Thanks to the OneFlow component introduced in OpenNebula 4.2, related virtual machines can be grouped into a Service. A Service can define deployment dependencies, as shown in this screencast. This screencast shows the OpenNebula Auto-Scaling features. A Service (group of interconnected VMs) can adjust the number of VMs based on performance metrics, or based on a schedule. OpenNebula will participate in the upcoming Ceph Community Day in NY, that will take place next Thursday, August 1st. Thanks to the expertise of Ceph team and the introduction and demo to OpenNebula and Ceph, this event is something you definitely need to attend to if you’re interested in combining these two powerful technologies. OpenNebula 4.2 Flame is Out! After the ground shaking release that was OpenNebula 4.0 Eagle, it’s time to stabilise features in this next release, OpenNebula 4.2 Flame. The principal aim is to strengthen the most demanded and useful features, reducing the complexity in order to better support the most used functionality. OpenNebula 4.2 Flame includes a more polished Sunstone interface, after its redesign in 4.0; with important usability enhancements. It also includes a new view for cloud users, designed to offer a minimal portal for virtual resource consumption. Datastore capacity is now monitored and used to limit the amount of storage size used by images. This is a first step to also control the runtime storage used by the VMs. The VMware backend has been completely redesigned with a more comprehensive storage scheme, more functionality and less dependencies. Also we have upgraded the Xen backend to support the new interfaces introduced in Xen 4.0. And last but no least, OneFlow, the multi-tier application (a.k.a. service) manager, it is included and fully integrated in the distribution. It includes also important new features related to service management and elasticity/auto-scaling. Check the full release notes for details. This is a stable release and so a recommended update that incorporates several bug fixes since 4.2 Beta. We’ve done our best to keep compatibility with OpenNebula 4.0 Eagle, so any application developed for previous versions should work without effort. Be sure to check the compatibility and upgrade guides. As usual OpenNebula releases are named after a Nebula. The Flame Nebula (catalogued as NGC 2024 and Sh2-277) is an emission nebula in the constellation Orion. It is located about 900 to 1,500 light-years away from Earth. https://opennebula.org/wp-content/uploads/2018/11/opennebula_cloud_logo_white_bg-4.png 0 0 Tino Vazquez https://opennebula.org/wp-content/uploads/2018/11/opennebula_cloud_logo_white_bg-4.png Tino Vazquez2013-07-26 14:32:002013-07-26 15:04:07OpenNebula 4.2 Flame is Out! OpenNebula 4.2 Beta is Out for Testing! July 19th, 2013. After the ground shaking release that was OpenNebula 4.0 Eagle, now its time to stabilise features in this next release, OpenNebula 4.2 Flame. The principal aim of this release is to strengthen the most demanded and useful features, reducing the complexity in order to better support the most used ones. This release includes an important subset of the features originally planned for 4.2, all the missing features have been automatically rescheduled to 4.4. Our goal with this release is to reduce your waiting time to test some exciting new features that are currently ready! OpenNebula Flame includes a more polished Sunstone interface, after its redesign in 4.0; with important usability enhancements. Datastore capacity is now monitored and used to limit the amount of storage size used by images. This is a first step to also control the runtime storage used by the VMs. The VMware backend has been completely redesigned with a more comprehensive storage scheme, more functionality and less dependencies. Also we have upgraded the Xen backend to support the new interfaces introduced in Xen 4.0. And last but no least, OneFlow, the multi-tier application (a.k.a. service) manager, it is included and fully integrated in the distribution. It includes also important new features related to service management and elasticity/auto-scaling. Check the full release notes for details. We are now set to basically bug-fixing and feature-freeze. Note that this is a beta release aimed at testers and developers to try the new features, and send a more than welcomed feedback for the final release. https://opennebula.org/wp-content/uploads/2018/11/opennebula_cloud_logo_white_bg-4.png 0 0 Tino Vazquez https://opennebula.org/wp-content/uploads/2018/11/opennebula_cloud_logo_white_bg-4.png Tino Vazquez2013-07-18 12:29:272013-07-24 12:21:54OpenNebula 4.2 Beta is Out for Testing! The first edition of the OpenNebula Conference will be a great opportunity to share experiences and meet people with expertise and interest in OpenNebula. The Conference will feature 6 keynotes, 2 tracks with 18 regular talks, 1 hands-on tutorial and 3 community sessions. Keynotes speakers include Daniel Concepción from Produban – Bank Santander Group, Zhihong Zhang from China Mobile, Steven Timm from FermiLab, André von Deetzen from Deutsche Post E-Post, Jordi Farrés from European Space Agency, Karanbir Singh from CentOS Project, and Ignacio M. Llorente and Rubén S. Montero from the OpenNebula Project. The talks are organized in three tracks about user experiences and case studies, integration with other cloud tools, and interoperability and HPC clouds and include speakers from leading organizations like CloudWeavers, Terradue, Akamai, NetWays, INRIA, BBC, inovex, AGS Group, Hedera, NetOpenServices, KTH, CESNET or CESCA. The Hands-on Tutorial will show how to build, configure and operate your own OpenNebula cloud. The Hacking and Open Space Sessions will provide an opportunity to discuss burning ideas, and meet face to face to discuss development. The Lightning Talks will provide an opportunity to present e a new project, product, feature, integration, experience, use case, collaboration invitation, quick tip, or demonstration. This session is an opportunity for ideas to get the attention they deserve. Here’s our monthly newsletter, with the main news from the last month, including what you can expect in the coming months. A new version of OpenNebula series 3 has been released, with version number 3.8.4. This version serves as a Service Pack, which allows users to maintain their current OpenNebula version as long as possible, preserving the stability and security of their data centers, as they transition from one OpenNebula Series to the next. The OpenNebula team is working full steam for the upcoming 4.2 release (expect the beta version in two weeks). Multiple changes are being carried out in the VMware drivers, aimed to give more control over VMware resources, and a more fine grained management of VMware virtual machines. Special attention is being paid to the storage backend option for VMware, polishing existing combinations and dropping some of the less used ones. New drivers to interact with Xen 4.2 are being developed. These will enable the use of new Xen features like VHD images and a more tight HVM integration. Another big effort is being carried out in OpenNebulaApps, in order to stabilize them and incorporate it into the main OpenNebula distribution. 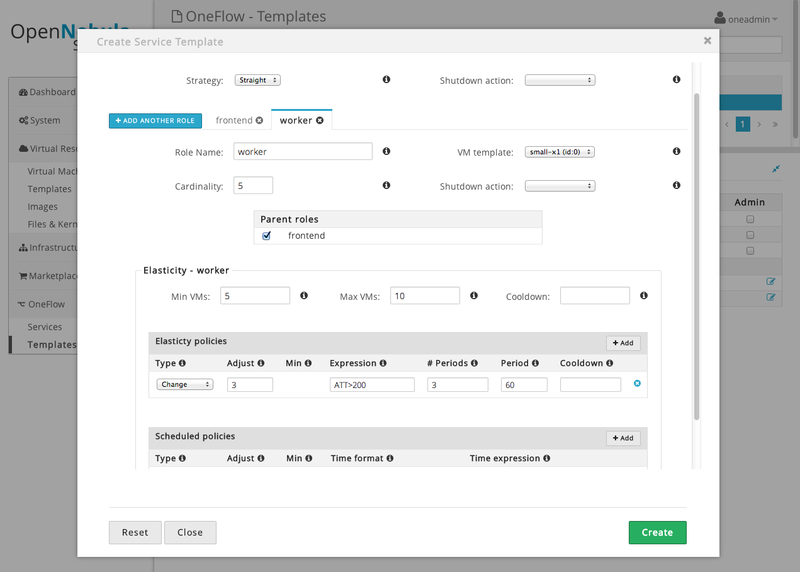 Special attention is being paid to the AppFlow component, with amazing features for service management, like for instance automatic elasticity. The testing process is being revised as well, with a strong focus in extending it to cover the new functionality developed in OpenNebula, including integration with third party components. This is not a pretty job, but we think it is of utmost importance. Throughout the history of the OpenNebula project, the community has a great record of helping a great deal in the developments. Last month was no exception, thanks to the CentOS and OpenNebula installation testing and documentation day, where OpenNebula users helped in the irc in matters related to CentOS packaging. Folks at OPTIMIS (Optimized Infrastructure Services) have contributed their toolkit to the ecosystem. OPTIMIS is an open source cloud computing research project that has recently published the final release of its toolkit (v3.0), which is now available in the OpenNebula Ecosystem. The OPTIMIS toolkit is fundamentally a cloud-enabling technology that ultimately allows users to schedule and automate the delivery of workloads to the most suitable venues (internal or external) based on policies such as trust, risk, eco-efficiency and cost. A very dear (to us, at least ;) ) contribution has been made by Alberto Zuin, in the form of a nice post comparing the simplicity of OpenNebula with that of the russian Soyuz. We completely agree with Alberto, it is important to stay in focus to deliver a quality product. Way to go! The community is also a great resource to find out which direction our roadmap should take. We launched a survey to collect feedback from our community regarding what is their preferred interface for cloud consumers and how we should invest our resources in cloud API enhancement and development. The survey was open for two days receiving feedback from almost 200 OpenNebula clouds. Guided by these results, our plans for the near future are to enhance and extend our implementation of the AWS API and to offer OCCI compatibility through the rOCCI component. We warmly welcome the Greater Denver OpenNebula Users Group! It is great to know that there are OpenNebula users out there gathering to talk about squeezing OpenNebula to get the most out of their infrastructures. We want to remind you about the First OpenNebula Conference. The Conference, based in Berlin between the 24 and 26 of september, will serve as a meeting point for OpenNebula cloud users, developers, administrators, builders, integrators and researchers and a unique opportunity for discussion and collaboration with other projects. The first OpenNebula Conference will deliver its educational content through 6 keynotes, 2 tracks with 18 regular talks, 1 hands-on tutorial and 3 community sessions (see this page for more details). The lightning talks, hacking and open space sessions will provide an opportunity to present lightning talks, discuss burning ideas, and meet face to face to discuss development. Sponsorship opportunities are still available, and you can check the conference page for full details about registration. OPTIMIS (Optimized Infrastructure Services) is an open source cloud computing research project that has recently published the final release of its toolkit (v3.0). The OPTIMIS toolkit is now available in the OpenNebula Ecosystem and can be downloaded from optimistoolkit.com. The code is also available on GitHub and in a publicly available SVN repository. The OPTIMIS project kicked off in 2010, co-financed by the EU’s FP7 framework program. The project is led by IT services company Atos and includes Umea Universitet, 451 Research, Universität Stuttgart (HLRS), ICCS, Barcelona Supercomputing Center (BSC), SAP, Fraunhofer-Gesellschaft, University of Leeds, Leibniz Universität Hannover, Flexiant, BT Group, City UNiversity London and Arsys. The primary goal of the OPTIMIS project was to optimize cloud infrastructure services by producing an architectural framework and a development toolkit covering the full cloud service lifecycle (construction, deployment and operation). With its newly developed programming model, integrated development environment and deployment tools, OPTIMIS gives service providers the capability to easily orchestrate cloud services from scratch, run legacy apps on the cloud and make intelligent deployment decisions based on their – or their customers’ – preferences regarding trust, risk, eco-efficiency and cost (TREC). It supports end-to-end security and compliance with data protection and green legislation. The toolkit also allows for developing once and deploying services across different types of cloud environments – private, hybrid, federated or multi-clouds. The OPTIMIS operation tools are intended to simplify and automate the management of infrastructure, and aim to improve resource utilization efficiency. OPTIMIS supports ‘best execution venue’ strategies. It is fundamentally a cloud-enabling technology that ultimately allows users to schedule and automate the delivery of workloads to the most suitable venues (internal or external) based on policies such as TREC. The OPTIMIS software tools are deployed in the datacenter, and are a complement to cloud management and orchestration platforms. Most of the OPTIMIS components are open-source-based, primarily Apache, but not all of them. Joining the OpenNebula Ecosystem makes perfect sense for OPTIMIS. Try out the toolkit and let the OPTIMIS team know what you think!